Photo © Stetner / iStockphoto. Brittle stars inhabit all the world's oceans and live in a variety of climate regions including tropical, temperate and polar waters. Brittle stars are subdivided into two basic groups, the brittle stars (Ophiurida) and the basket stars (Euryalida). 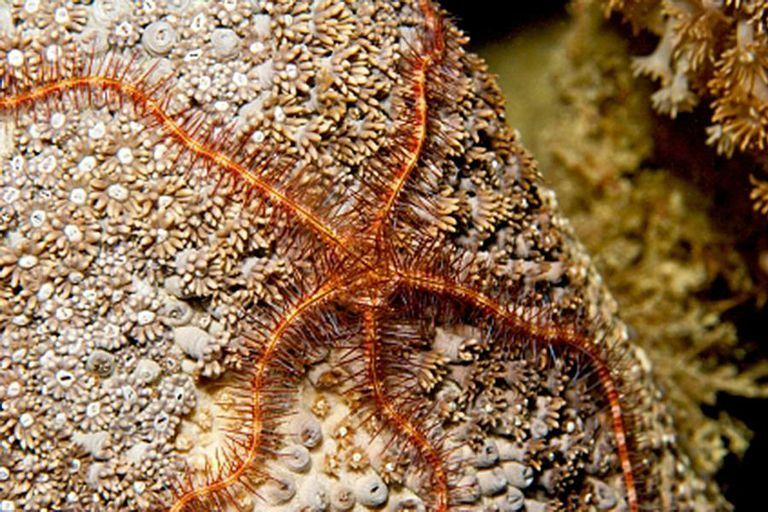 Brittle stars have a star shaped body. Like many echinoderms, they exhibit pentaradial symmetry, a 5-sided radial symetry. Brittle stars have five arms that join together at a central body disk. The arms are clearly delineated from the central body disk, and in this way brittle stars can be distinguished from starfish (starfish arms blend with the central body disk such that it is not easy to delineate where the arm ends and the central body disk begins). Brittle stars move using a water vascular system and tube feet. Their arms can move side to side but not up and down (if they are bent up or down they break, hence the name brittle star). Their arms are extremely flexible from side to side and enable them to move through the water and along substrate surfaces. 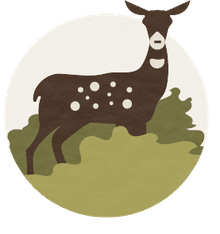 When they move, they do so in a straight line, with one arm serving as the forward directing point and other arms pushing the body along that path. Brittle stars and basket stars both have long flexible arms. These arms are supported by calcium carbonate plates (also known as vertebral ossicles). The ossicles are encased in soft tissue and jointed plates that run the length of the arm. Brittle stars have a nervous system that consists of a nerve ring and that encircles their central body disk. Nerves run down each arm. Brittle stars, like all echinoderms, lack a brain. The have no eyes and their only developed senses are chemosensory (they can detect chemicals in the water) and touch. Brittle stars undergo respiration using bursae, sacks that enable gas exchange as well as excretion. These sacs are located on the bottom of the central body disk. Cilia within the sacs direct water flow so that oxygen can be absorbed from the water and waste flushed from the body. Brittle stars have a mouth that has five jaw-like structures around it. The mouth opening is also used to expel waste. An esophagus and stomach connect to the mouth opening. Brittle stars feed on organic material on the sea floor (they are primarily detritivores or scavengers although some species occasionally feed on small invertebrate prey). Basket stars feed on plankton and bacteria they catch by suspension feeding. Most species of brittle stars have separate sexes. A few species are either hermaphroditic or protandric. In many species, larvae develop inside the body of the parent. When an arm is lost, brittle stars often regenerate the lost limb. If a predator catches a brittle star by its arm, it loses the arm as a means of escape. Brittle stars diverged from other echinoderms about 500 million years ago, during the Early Ordovician. Brittle stars are most closely related to sea urchins and sea cucumbers. Details about the evolutionary relationship of brittle star to other echinoderms are not clear. Brittle stars reach sexual maturity at about 2 years of age and become full grown by 3 or 4 years of age. Their life span is generally about 5 years.